How to get there: From the city of Bodø, drive east on Hwy. 80 to Fauske, then south on E-6. The road leaves the fjord and heads south, climbing gently in Saltdalen. About 1.5 kilometer before you get to the road fork where Hwy. 77 heads east into Junkerdalen and onwards to Sweden, there is a Shell gas station on your left. 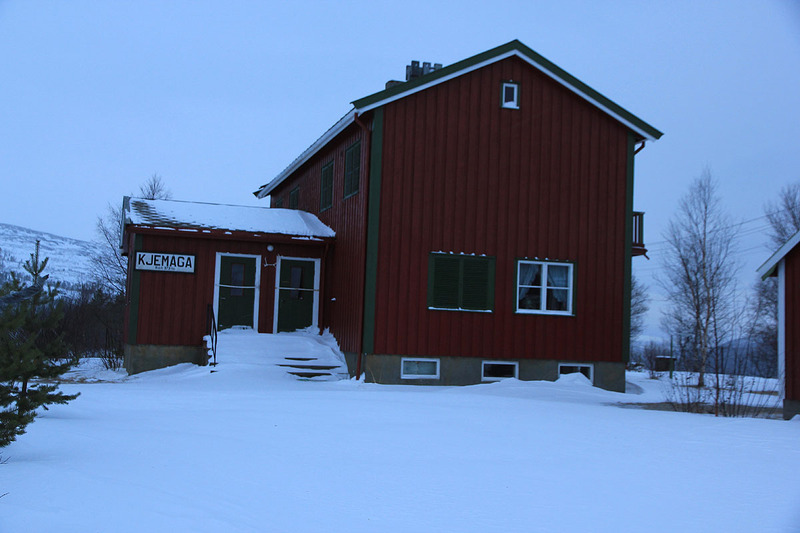 The place is called Hestbrinken on the M-711 map. They advertise with the national park (Saltfjellet/Svartisen National Park). This place offers meals and overnight accommodation. Continue further south along E-6 for approximately 10 kilometer, watch for signs to Polarsirkelen Høyfjellshotel (Arctic Circle hotel, this mountain is just north of the Arctic Circle.) Make a sharp right following the signs for this hotel. This small road runs uphill and ends at a small railroad station. About half way up this hill, you may turn left and locate the hotel. This is a place where one can stay, however at certain (off-season) times the hotel may be closed. Just below the small side road that serves the hotel, there is another small road forking left and leading directly to a parking area. Just beyond this parking area (location N66:44.238, E015:27.977, elevation 482 meter) is a self serve DNT hut. Provided you have a key (available from DNT offices), this is a good alternative to the other accommodation possibilities. Trailhead 2012: From Bodø, drive only to Stordjord, this location is a pretty big parking area and some services, the name is Saltdal Turistsenter. This is about 10 kilometer before you get to Lønsdal, described above. There is a DNT self service hut here. To find it, drive across the big parking area keeping right. A small road run downhill here, keep right in the first fork, then left (in a downhill) at the second fork. Continue flat and locate the hut on your right hand side. From the Saltdal Turistsenter, drive about 100 meter north (that is turn right onto E-6), then take a small road that forks left. This road will take you across the river (narrow bridge). Go right at the next small roadfork. At the next fork, keep left. When I was there, the road haad snowed in for the winter (not plowed), I found a small parking (one car) a few meter along the right fork. This location is N 66.81409 E 015.37993, elevation about 120 meter. In the summer, I assume that you may drive up to the trainstation or somewhere close to it. Route in 2006: From the railroad station (trailhead), the first goal is to reach lake Kjemåvatnet. In summer, one should likely plan on a route that runs around the south end. A trail runs from the railroad, then forks southwest. Hike north along the west side and gain the saddle 728, west of Fremmerknausen (788m). In winter, the best route is to access the (private) mountain huts located on the east side of the lake. Ski northwest along the summer trail, most likely there is a ski track here that leads to the lake. Cross the lake and gently climb to the saddle 728, as described above. From here do an ascending traverse in order to access the area north of Addjektind (1444m) at elevation about 1050 meter. You are now at the base of the mountain. Continue north while climbing the ridge southwest of Nertind (1228m), then gain the east shoulder (steeper) at approximately 1560 meter. From here, it shall be possible to climb the summit. In winter, be aware of possible avalanche dangers. Route in 2012: This route is recommended. Follow the road as it zig-zags uphill. There is a long section going left. Note that there is a road fork (well signed) where our route goes right. You will arrive at the old railway station called Kjemaga. From here, cross the tracks, then head uphill and right. You will see a communication tower/antenna. Continue uphill along the right side of a small creek and then turn more left on the right hand side of a small valley coming downhill. Continue uphill in more gentle terrain. As you move slightly left of the fall line you will see the natural (big col looking feature) way to gain elevation between two areas of steeper terrain. Ascend on the right hand side of the slope (somewhat steeper). As you reach more gentle terrain higher up, turn a bit more right and follow a gentle ridge (having a small valley on its right hand side). This ridge will lead you into another basin at the upper end of a valley coming up on your right. 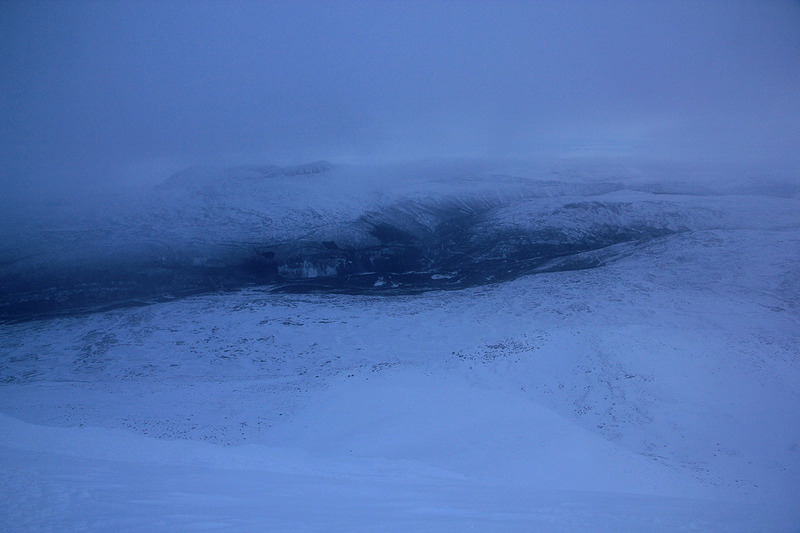 The summit is now right ahead and one can clearly see the big shoulder extending east a bit below the summit. Ascend this bowl towards the summit. As the terrain gets steeper, traverse more right and gain the east shoulder just below the final east ridge. Follow this ridge to the summit. This route is probabely the easiest route on this mountain. Trip Report / Comments: Last year, I signed up for the Bodø Mountaineering Club ski trip in early November to Suliskongen. However, they cancelled the trip and I ended up climbing Breidviktinden instead. Thus, I was quite happy to see that the Bodø chapter (of DNT) again scheduled a mountain trip in early November, this time to the border peak Nord Saulo, the highest point along the Norway - Sweden border and having more than 1000 meter prominence. However, the Bodø Mountaineering Club cancelled this trip as well, so here I am high up north with short days for the second time. The weather forecast was pretty bad and I quickly decided that Nord Saulo was perhaps a bit beyond a reasonable solo ski trip, in particular, since it has a neighbor peak in Sweden that really should be climbed at the same time. Thus, I decided to make an attempt on Ølfjellet, also called Ørfjellet on the M711 map. This still looked only marginally possible, a lot would depend on the weather as well as the skiing conditions. Scene: A desolated railroad station, it is completely dark, the wind is moderate and it snows. In order to maximize my chances of success, I decided on an "alpine start", as I skied across the railroad tracks already at 0415. 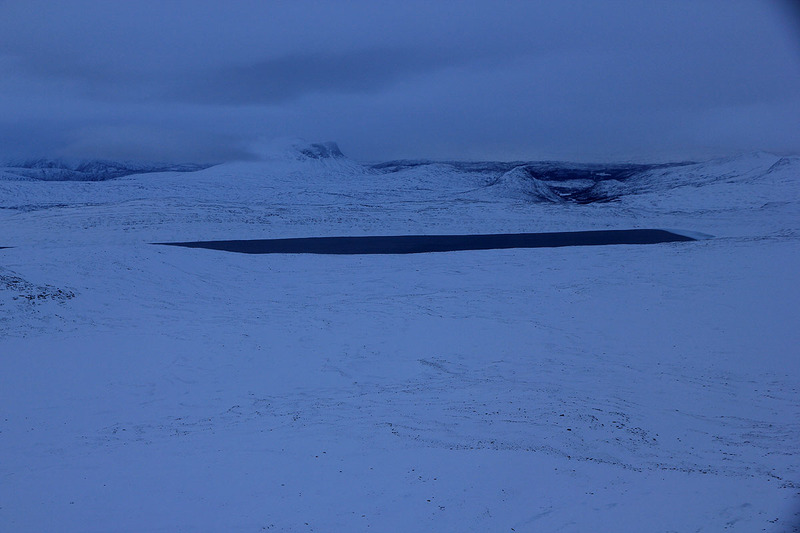 With a good headlamp, I started out in the direction of a pretty good sized lake, Kjemåvatnet (620m). I had decided to ski near the south end of this lake. Almost immediately, I found myself in pretty bad terrain for skiing. Large (several cubic meter) boulders seemed to be scattered everywhere. Either I discovered standing on top of such a huge rock with no easy way to proceed, or I would be just between these rocks with snow above my knees and more big boulders blocking further progress. Darkness made it difficult to navigate around these trouble zones. I could see the general features of the hillside and my light was fine for local visibility. Intermediate range, which would help finding a better route, was hidden in darkness. I continued to struggle and the terrain got slightly better after a while. Progress was still hard, the wind got stronger and at 06:05, I was finally approaching the lake, in the last 70 minutes I had gained 20 meter of elevation and covered a horizontal distance of only 1.45 kilometer. "Go back" said the wind and the mountain, "No" replied the small human in the large wilderness. I entered the lake and carefully probed the ice, it seemed safe. The next stretch would be free of boulders, cut across the lake to a very pronounced penisula that would serve as a good marker for where I should enter the shore. However, after only a few meter on the lake I ran into a layer of water on top of the ice. This transformed instantly into 5-10 centimeter of frozen ice/snow attaching to my skis. I carried a tool for this purpose. Take the skis off, clean them for snow and ice, then reattach and continue skiing. Soon, another patch of water, forcing a repeat of the procedure. I got closer to where I should get back on land and yet again more water, more ice and another stop to clean the skis. My route headed gently uphill to a saddle at 728 meter, gradually daylight was coming and my headlamp could be turned off. I had skied slightly more than 5 kilometer, the time was 07:39. Almost 3.5 hours of really hard work to gain 5 kilometer is not impressive, however, I was 5 kilometer closer to the summit, it was still early morning and the future looked brighter. The next leg called for an ascending traverse across and up the broad valley going east between Addjektind (1444m) and Ølfjellet. The terrain ahead was completely dominated by rocks, having smaller patches of snow between them. The wind had picked up to gale force and yet again whispered: "Go back". I did not much consider the proposal, it was still early in the day. The weather was not good, but I have seen it worse. I brought enough gear on this trip to spend a full night out if the conditions should force me, a bivu-bag, extra socks and gloves, extra fleece, a snow shovel for digging a shelter etc. I sent a few thoughts to how I would manage an unplanned night, decided that that would not be a very difficult situation, then pushed on. Crossing the main creek coming down from above, I noticed it was partially open and made a mental note that I could count on filling up more water here on my return. The mountain was completely hidden in clouds/fog, this was unfortunate, as I had no reliable information and needed to make some decisions about which ascent route to follow. Suddenly, my ski felt loose. Open binding, no, the screws that attach the binding to the ski had come loose. This is potentially serious. I carried a repair kit including spare screws as well as screwdriver etc. A major repair stop was called. Again, there was "an inner voice" testing: "Go back", after a few moments of reflection on questions that started with "what if? ", I firmly continued my traversing ascent, zig-zag-ing between all the rocks. I arrived at the base of the mountain, skiing on its south slope improved considerably, the wind was weaker and I felt confident that the trip would achieve its objectives. It was a grey and windy day, but I felt fine and very much alive. An important decision was coming up: What route would be best in order to make the climb all the way to the summit on skis? The mountain slope disappeared directly up into the low clouds preventing me from any views of the possible routes with respect to skiing and steepness. I took a second careful look at the map and a route that I had briefly discussed with Arnt the day before, seemed to present itself as the safest option. Ski around on the east side, through a local saddle and near a small lake, then climb a more gentle slope to the top of the north ridge and follow this ridge to the summit. I had originally planned to ascend from the south, then possibly move out to a high east shoulder, the steepness of this route was unknown, however the north ridge looked safer. The north ridge would be quite a bit longer, but with my early start, time was not really an issue. With a firm plan, I quickly reached the small saddle and located the lake below. I tried to keep some elevation by contouring in the slope west of the lake, however this was a pretty steep area with big boulders and overall it would have been better to just loose these 40 meter of elevation. The weather now took a turn for the worse. The wind increased to gale force and there was considerable snow drift in the air. 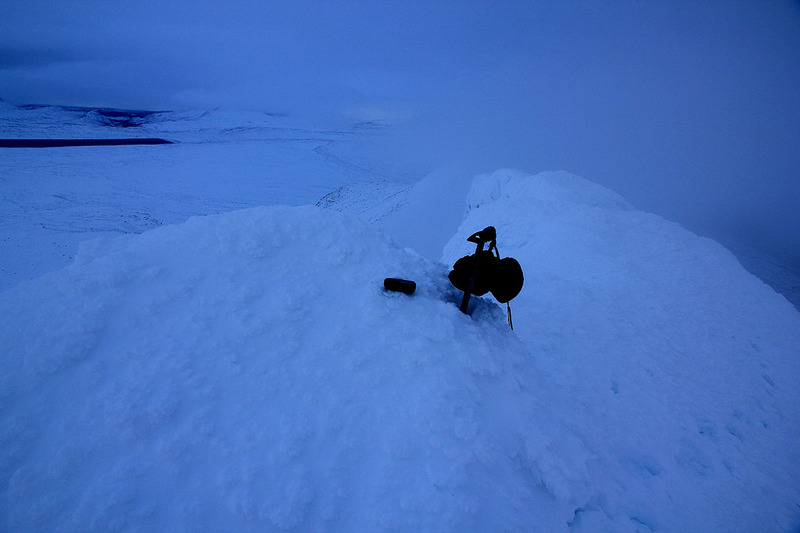 As I climbed higher on the east slope, I was engulfed in the clouds and visibility was limited to the nearest rocks on my slope. Again, the wind whispered: "Go back, this is no place to be for a human today." Forced to assess the situation, time, snow slope, physical condition, I concluded that there was no reason for abort and that the summit now was within range. I skied among giantic boulders, then hit a steeper snow slope that required a traverse and avalanche considerations. There had been a recent snowfall, temperature change and wind, so steep snow slopes without any signs of rock should be approached with respect. The current slope seemed OK, I could avoid the really steep part and in a few more minutes I topped out on the north ridge, a major milestone. 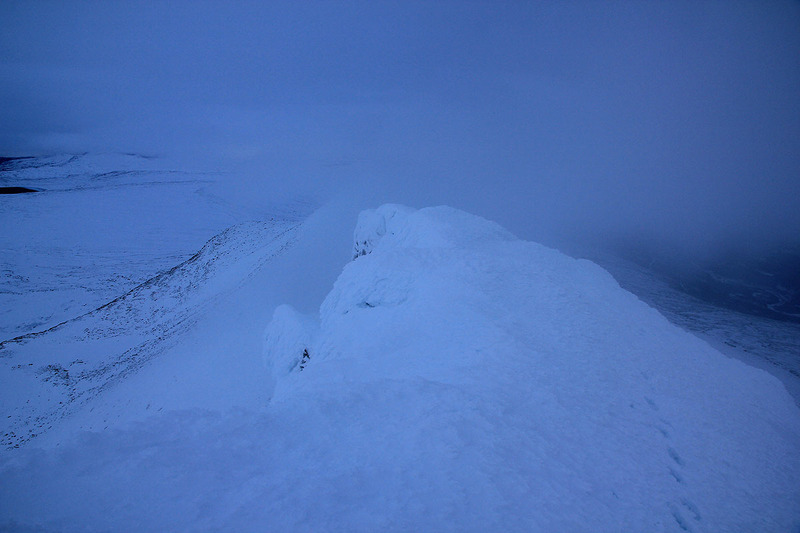 The ridge towards the south summit climbed gently, had a steep wall on its left and a more gentle slope to the west. However, it was full of large boulders and skiing looked complicated. I decided to leave the skis and continue on foot. Easier said than done, the snow between the boulders was very deep and progress along the ridge became a struggle. 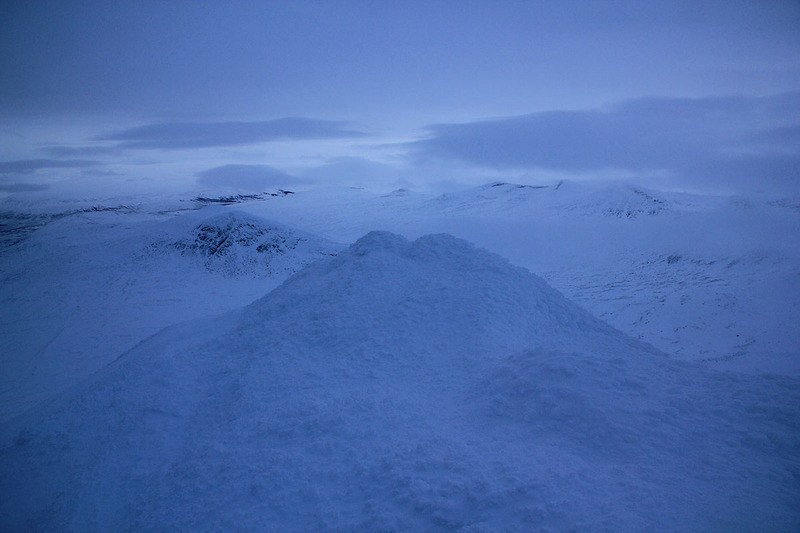 After almost one hour, I had only advanced about 150 meter, the ridge looked more agreeable, but covered by deep snow. I took the hard decision to return to my skis and ski the ridge instead of walking. Bummer!, more than one hour and lots of energy wasted for no gain. The skiing was just as hard as it originally looked, but clearly better than walking. I got back to my "highest point" and continued beyond with somewhat easier skiing. Good, it seemed like the summit would be mine in at most another 30 minutes. The ridge turned more rocky and less suitable for skiing. Shortly, I had to leave my skis and continue on foot. This time, there was really no choice. The snow was still difficult to cross on foot, but I made steady progress and the distance remaining was indeed short. The fog was dense and the wind pretty strong. A few shades that gradually became clearer, slowly showed a significantly steeper ridge ahead. More signs of trouble, a steep cliff also on the right hand side. I got all the way to the base of this steeper section, to make things more complicated, the ridge also had a layer of ice as it rose ahead. "Go back", said the mountain, it did not whisper any more, the message was loud and clear. I considered my future; a steep and icy ridge, bad wind and snow drift. It had taken me almost 9 hour (one way) to get here. I carried crampons and ice axe, this would definitely be needed. The terrain ahead would take time, my latest turn around time at 1400 would be exceeded. Of more concern, how safe would it be to solo this ridge under the prevailing conditions? The steep and forbidding cliffs on the right were unexpected and unpleasant. A slip on the section ahead would not be acceptable. My skis were further down on this ridge, thus a safe, solo downclimb would also be required. Any alternate route down would not connect with my skis. My fingers were not very warm, but nothing to worry about right now. My conclusion was about to change. "OK mountain, you are right" said the small human and reluctantly turned around and started do retrace his foot steps as he slowly descended the ridge. This was indeed unfortunate. I turned at 1690 meter elevation according to my GPS. Thus, only 60 vertical meter remaining. With the steepness of that last section, this must have been what was left. With somewhat less time in the early morning I would have tried a more direct approach. This is appearently what one should do. Climb the slope on the south, bear east as the slope steepens and reach the east shoulder. From here to the summit there is no dangerous ridge, however the steepness of this east facing slope might carry an avalanche hazard if (wind) loaded with snow. Most likely, that slope still had visible rocks and a snow cover that would be safe. I returned back down to the lake, traversed across to the 728 meter saddle along a somewhat lower (and better) line than on my approach. A good rest with water as I crossed the open creek was also welcome. It got dark as I arrived on the upper slopes of the large lake. I decided to cross it more directly to an area with some cabins. This would be a slightly shorter route, possibly I could find a ski track from the cabins. As I set out, the weather now improved considerably. The wind died down, the moon came up and illuminated the landscape. I succeeded getting onto the lake without running into water on the ice. In fact, the long stripes of wet areas could be seen reflecting the moonlight. I set a course across and soon discovered that there was light coming from the windows of a hut on the opposite side. This would mean people and therefore also a track to follow back to the train station. Three men had come up on Friday and planned to stay until tomorrow Sunday. They had been out looking for ptarmigans, so far they had gotten three. They had seen my tracks near the southern end of the lake. I stopped by for 10 minutes drank some water, told them about my day as they told me that the normal route indeed went up from the east shoulder. I said farewell and skied their good track. (A 4th. member of their group had skied down just hours ago.) Arriving back at the train station and my car at 1900, 14:45 hours, perhaps the longest first ski trip of any sesaon I could remember. I stopped by the hotel, paid for the DNT hut and ordered dinner. A call was made to Bodø in order to reserve a hotel. The two hour drive back ended a long day. I booked an early ferry for the next day, determined to make an attempt on Eidetinden before flying south to Oslo and Bergen. 2012 climb. The small human was back, he was 6 years older, but carried experience from the 2006 epic attempt. It would only be fair to make a new attempt in November. The days are short and the snow is often deep with no crust layer to prevent you from sinking in. I arrived in Bodø almost 3 hours behind schedule. My taxi driver in Bergen ran out of fuel on his way to the airport. I lost my flight and had to buy a 4000 NOK new ticket on the next and last possible flight to Bodø. 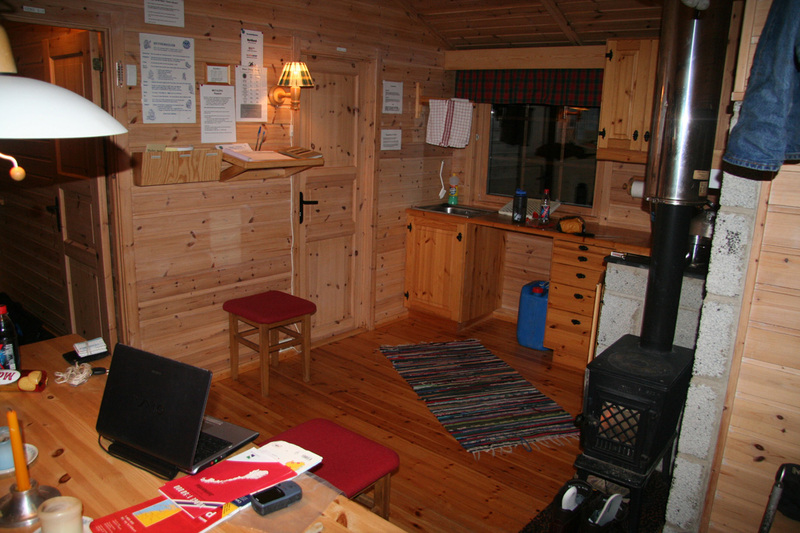 I stayed at the Storjordstua DNT self serve hut. Really only slept there, but it is very convenient located for my new trailhead. I started out towards the small forest road that runs uphill to the railroad around 0700,it was still dark. I had breakfast in the car, then discovered that my ski bindings were set for another (longer) boot. I carried the tools for adjustments, however, the time was already 0800 when I finally got started. Unfortunately, this road was not plowed and I had to start quite a bit lower than what my plan called for. It was heavy going uphill while breaking trail along this road. I made the railroad at 0900, one hour after starting. Above the railroad, the terrain was pretty messy, but the best route runs next to the telecommunication tower that one may see from the railroad station. Higher up, skiing got easier and I made good progress up towards the east shoulder of the summit. There was no sun and clouds were obscuring my view. I parked my skis about 200 vertical meter below the summit, it looked like going on foot would be easier, in particular downhill. The last 200 vertical meter turned into a struggle. The snow was not in any way compact and I kept falling into deep holes between boulders. I had left my backpack with the skis, so only camera, ice axe and crampons. Finally, on the summit ridge. A steep drop on my right and what looked like the highest point on the ridge straight ahead. I was there at 1320, so 5:20 up. I stayed around for 10 minutes. Interesting to look back towards the valley where I started, a 1600 meter vertical climb. The view west was pretty good, but generally the drifting clouds obscured the view. The summit is located on a short, but fairly horizontal part of the main ridge, the distance south is short, while the ridge extends a bit further north. My previous attempt was to arrive along this ridge from the north. I was back at the railroad station shortly before 1600, it was certainly getting dark. Someone had driven a 4WD vehicle up the road while I was higher. Thus skiing was nice and I returned to my car by 1615. 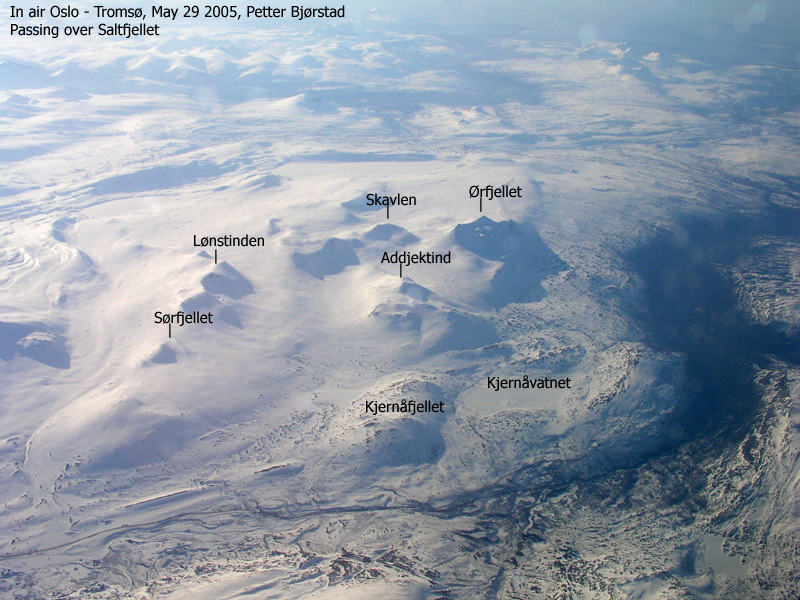 Ølfjellet, as seen from the air on April 29. 2005. The entire route from the railroad to the lake and up on the summit ridge is visible. Note that the annotation points to the lower north summit, while the highest summit is further south. Lønsstua, the DNT self serve hut where I stayed. No additional pictures because the weather (snow-drift) really prevented photography.